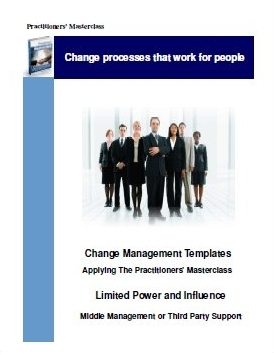 These change management templates are for ordinary non-management people, supervisors, middle management, and of course organisational leaders. Traditionally, change management books and courses are written from the perspective of someone who has the power and influence to initiate and implement. This is correct and important and the first of the change management templates in this package is for "Organisational Leaders". But these change management templates are also for the many people using the Practitioners Masterclass materials who do not have much, or any, power or influence. People who in many cases have change imposed upon them, by senior management who neither understand nor apply change processes that work for people. For a full listing of all 20 change management templates please see the graphic below. The high level key events in the early life cycle of the change initiative that are specific to the power and influence profile and organisational role. There is more to this than just producing "tick box checklists"! Much more. Whilst there clearly is a place for the typical formulaic change processes that integrate seamlessly with checklist driven project management processes, what is offered here is an adaptive approach based on applying the principles introduced and discussed in the Practitioners Masterclass. What I mean by an "adaptive approach" is one where change leadership, management at all levels, and non-management employees interact with their human environment and modify their behaviour in response to that environment. These templates are designed to be easily and readily adapted to new and changing conditions. These templates are also completely compatible with traditional programme management and project management methods and processes as they use a programme management based change model and methodology. "An excellent single source set for those managing change"
"Very complete and easily understandable for a beginner as well"
"It addresses all aspects of managing change - and provides a way to measure change management competency in an organisation"
"Insightful and meaningful - provides additional tools to improve the outcome in future changes"
Imagine that you have commissioned me to meet with you and talk through the key events in the early life cycle of the change initiative - from the perspective of your own personal level of formal power and influence within your own organisation. "What are the key phases of this initiative?" "Based on your (and others) experience - where's this thing most likely to stall at each of these phases?" "What is the one big thing that I really need to do to get maximum leverage and positive impact at this stage?" "What questions should I be asking and discussing with my boss - my staff - my colleagues?" "What's my clearly defined objective at this stage?" "But realistically, tell me what is most likely to go wrong - so I can anticipate it and act most resourcefully and effectively?" "Give me some indicators so I will be able to know how I'm doing?" "I've read and understood the Practitioners Masterclass materials - can you give me some specific guidance of what to do and how to apply it?"